The Cain Center for the Arts continues to gain momentum. 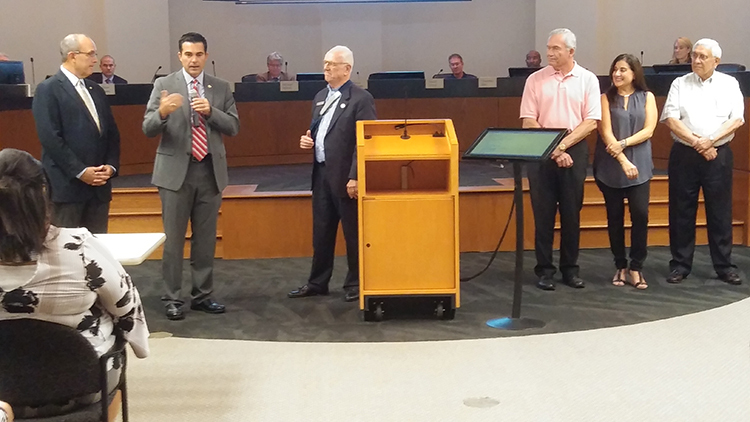 NC Rep. John Bradford and NC Sen. Jeff Tarte—the first a former town commissioner and the latter a former mayor of Cornelius—came to the Town Board meeting Monday night to announce a $125,000 state appropriation for the new Cain Center for the Arts. The $24 million arts center was launched with a $4 million bond referendum approved by voters in 2013. Two weeks ago, Cornelius residents Ericka and Bill Cain revealed a $5 million gift to the center, which will be named in their honor. With $4 million from the bond issue and other contributions, about $12.9 million remains to be raised. The Cain Center for the Arts will be the cultural cornerstone of Lake Norman—as well as an economic development catalyst for downtown Cornelius. The new center will be built on town-owned property just to the west of the Police Station. It is expected to anchor the revitalization of the center of town. The center will work with the Cains to create a new organizational brand, with plans for unveiling in early November. Cornelius residents overwhelmingly approved a $4 million bond project for downtown redevelopment projects. The need for a community arts center was identified to complement the growing arts district in Old Town Cornelius.